Editor’s note: The Ottoman-era building that houses this restaurant is currently undergoing restoration, which means that the restaurant is closed for now. According to one of its owners, the restoration work will be completed next summer and the restaurant will reopen with a new and improved kitchen. With the particularly un-catchy name of Doğu Türkistan Vakfı Aş Evi (or East Turkistan Foundation Food House), it’s clear this restaurant is not aiming for mass-market appeal. Rather, the place functions as a kind of public service agency. Located inside the charming and very pleasant courtyard of a 16th-century former medrese (religious school), Doğu Türkistan Vakfı Aş Evi (DTVAE from here on) serves up hearty dishes for homesick exiled Uighurs, a Muslim Turkic people who hail from Western China’s Xinjiang province, or “East Turkistan” as it is known in Turkey. Turks and Uighurs share a linguistic bond, and many in Turkey romantically think of the Uighurs as the “original” Turks. But the two peoples also share a strong culinary bond, with Uighur cooking providing perhaps a blueprint of what the “original” Turkish cooking might have tasted like. Where the classic Turkish kitchen reflects a mix various regional influences (Aegean, Middle Eastern, Balkan) and the highfalutin tastes of the Ottoman court, Uighur cooking retains the simplicity of a formerly nomadic people. So simple, in fact, that the menu at DTVAE is basically limited to three items – and two of them are different takes on mantı, the traditional Turkish dumpling. The restaurant’s centerpiece dish is lagman, a main staple of Uighur cooking, which is made from handmade noodles that are boiled and served along with a stir-fry of beef, onions and green peppers. On our recent visit to DTVAE, the head-scarved cook was busy in the kitchen rolling out long strips of lagman, which somewhat resemble udon noodles. 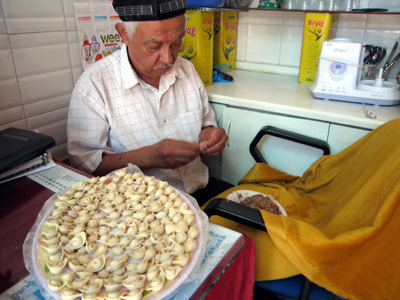 In another room, an older man was methodically stuffing small pockets of dough with a ground meat mixture to make one of the restaurant’s mantı dishes. Boiled and then topped with yogurt and red pepper flakes, the mantı was delicious, putting most of the other versions found around town – which seem to favor dough over filling – to shame. The restaurant’s other mantı dish – a much larger dough pocket that was stuffed with a meat/onion mixture and reminded us of a Chinese soup dumpling – was also very nice, especially when eaten with a schmear of the oily, red pepper paste that we found in a jar on the table. DTVAE has a few outside tables, where you can eat under the shade of three massive maple trees, and a handful of tables inside. The restaurant – a peaceful oasis located on a side street not far from the grand Süleymaniye Mosque – is connected to a Uighur cultural center housed inside the madrasa, and on a recent visit, the place was plastered with copies of articles from the Turkish press reporting about the recent ethnic violence in Xinjiang, in which some 200 Uighurs and Han Chinese died. Nearby us sat small groups of Uighur men chatting and slurping up their lagman along with bowls of steaming green tea, transported back, as we were, to East Turkistan. 1141 Brighton Beach Ave, Brooklyn, New York 11235. Tel +1(718)743-3832, Lagman come in several forms (soups, stir fried, etc). The Lagman soup has Lamb and a lot of fennel. Needless to say, after eating fresh handmade Lagman it is very difficult to go back noodles from a super market shelf. 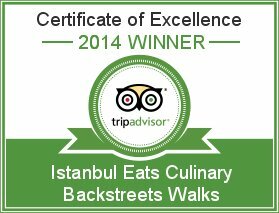 Thanks to Istanbul Eats I now have another place to check out in Istanbul. Two out of three of the lagman at the aforementioned Kashgar in Brighton Beach are more or less purely Uzbek. That place is somewhat lacking in its Uighur items unfortunately. I’ll be trying this East Turkestan place tomorrow or the day after by the way. My God! The people in this place are so lovely. I showed up terribly late and when they frankly should’ve been closing, but they stayed open to serve me food. After a long discussion about my time in Xinjiang I managed to convince them to do another 3 dishes for me tomorrow upon request. 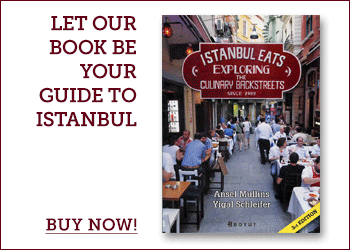 It isn’t noted in this review, but the prices here are flat out amazing for Istanbul. 5.50 for enough lagman to sink a ship! Also, if you talk them into making suomien (small square noodles that are fried more heavily than lagman) it is literally better than I had in Xinjiang. In a city filled with the most hospitable people you can imagine East Turkistan Foundation Food House is the pinnacle of kind, courtly treatment of patrons. 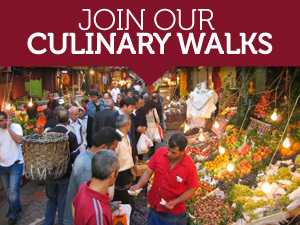 I am truly intrigued by the diaspora of people and their food, art, architecture, and more. To learn of things and connect them to another point or origin is fascinating. I live in China and write about food. It’s fun to stand from one point and follow the trail of food across regions and to other countries. Jiaozi to Manti, Gyoza, Momos, raviolis, and other names, I’m sure. I couldn’t find this place. Is it still there? There is construction in the courtyard, and I was directed across the street, and never found the restaurant. I went there at the weekend and some people told me outside that it was closed down, may be because of the construction work? Any idea when this will re-open? We went by there the other day and the restoration work was still ongoing. There was no clear indication of when it was going to end, unfortunately. Anyone know if this place is still around? We heard from our Uighur connection that it is likely to reopen soon. Fingers crossed. We’ll keep you posted. Ditto, do you guys know if this restaurant has been re-opened? We just walked by and it was still closed but it looks like they are preparing to re-open soon. We will be going by there before we leave in June gain. Will keep you posted. Thanks for the info, and please let us know what you find out when you go by there again. We’re keeping our fingers crossed!